Who Cares? is a professionally bound lap book with colorful and inviting images throughout its 225 pages. In addition to the book itself, you will also receive 2 Cd’s with 12 meditations which follow the chapters and support you on your journey. This guidebook will be your companion along your caregiving journey. You will find “mini-tips” sprinkled throughout to encourage you to begin to take care of yourself, access the services available in your community and teach you ways to ask for the help you need from family and friends. Elizabeth supports readers in caregiver education with encouragement, resources and relief. Elizabeth helps you find humor and even moments of joy in the midst of caregiving. Who Cares? shares insightful activities and strategies for practical ways to cope with your “new normal”. You will also receive over 60 minutes of guided relaxation practice that follows the book chapter by chapter. Who Cares? will lift you up and let you know you are not alone in your journey. Elizabeth Rawson has a Masters In Psychology and Creative Arts Therapy. Elizabeth is a published author, accomplished speaker, and a caregiver coach. This book is incredibly supportive, comprehensive and a wealth of information. I am refreshed in reading that what I am doing is important and that I am important, too. Who Cares? captures the unique survival skills needed by today’s family caregiver. Elizabeth’s practical solutions/suggestions only confirm and promote the importance of self-care! 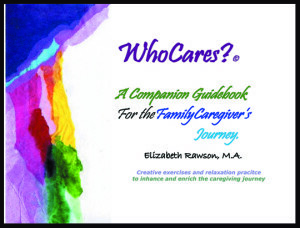 Ms. Rawson recommends many ideas that will help you along this caregiving journey. Caregivers deserve that same quality of life and well-being that they are trying to give their loved ones. I’ve seen Elizabeth be a caregiver and work with many caregiver families, so she knows. Her book has helped me to see the burdens AND the blessings in trying to manage this role. It is NOT self indulgent to want to survive this! 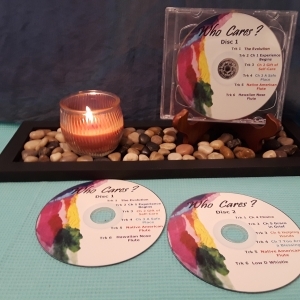 My moms gift…Encouraging caregivers and bringing awareness to their needs. 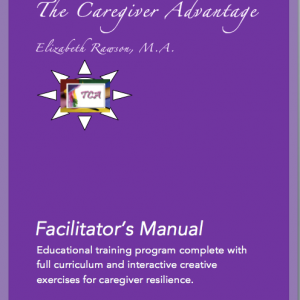 She has written a beautiful interactive workbook for caregivers. Elizabeth really knows her stuff and shares it with love.